• High Card – Five unrelated cards with no pairs, ranked from highest card down. • One Pair – A pair and three unrelated cards, ranked by the size of the pair. When pairs tie, the ranks of the unrelated cards (called kickers) are compared. • Two Pair – Two pairs and an unrelated card, ranked first by the size of the larger pair, then by the size of the smaller pair. When both pairs tie, the kicker is compared. • Three of a Kind – Three of a kind and two unrelated cards, ranked as pairs are ranked. • Straight – Five sequentially connected cards, ranked by the highest card. An Ace may play low for an A-2-3-4-5 straight. • Flush – Five cards of the same suit, ranked from the highest card down. • Full House – Three of a kind and a pair, ranked first by the size of the three of a kind, then by the size of the pair. • Four of a Kind – All four of a kind and one unrelated card, ranked as pairs are ranked. • Straight Flush – Five sequentially connected cards of the same suit, ranked by the highest card. • Royal Flush – The highest possible straight flush from Ten to Ace. • An Ace may play low for an A-6-7-8-9 straight. ​• Three of a kind beats a straight. The Short Deck order of hand strength, from weakest to strongest, is: High Card, One Pair, Two Pair, Straight, Three of a Kind, Full House, Flush, Four of a Kind, Straight Flush, Royal Flush. A-5 Low hand ranking is used to award the low half of the pot in all hi/lo games, including Omaha Hi/Lo and Stud Hi/Lo. A-5 hand ranking is also used in the games Razz and Badacey. • Straights and flushes do not count against the hand. • The best possible low hand is 5-4-3-2-A. • A player with the hand 7-6-5-3-2 (a 7-Low) would win against a player holding 8-5-3-2-A (an 8-Low). • If both players have the same high card, the next highest card is compared. The hand 8-6-5-4-2 (an 8-6 Low) wins against 8-7-5-4-A (an 8-7 Low). • Players with identically ranked 5-card low hands tie and split the pot. If neither player has a high-card hand (for example, if both players have a pair or stronger), hands are compared using traditional high hand rankings, and the lowest hand wins. In Hi/Lo split games with an 8-or-better qualifier, players must make an 8-Low or better to compete for the low half of the pot. 2-7 Low hand ranking is used in 2-7 Triple Draw, as well as Badeucy. 2-7 ranking is the exact inverse of traditional high hand ranking. • Straights and flushes count against the hand. • The best possible low hand is 7-5-4-3-2. • A player with the hand 8-7-6-5-3 (an 8-Low) would win against a player holding 9-5-4-3-2 (a 9-Low). • If both players have the same high card, the next highest card is compared. The hand 8-6-5-4-3 (an 8-6 Low) wins against 8-7-4-3-2 (an 8-7 Low). Badugi hand ranking is used in the games Badugi, Badacey and Badeucy. Badugi hands are ranked differently from traditional lowball rankings. 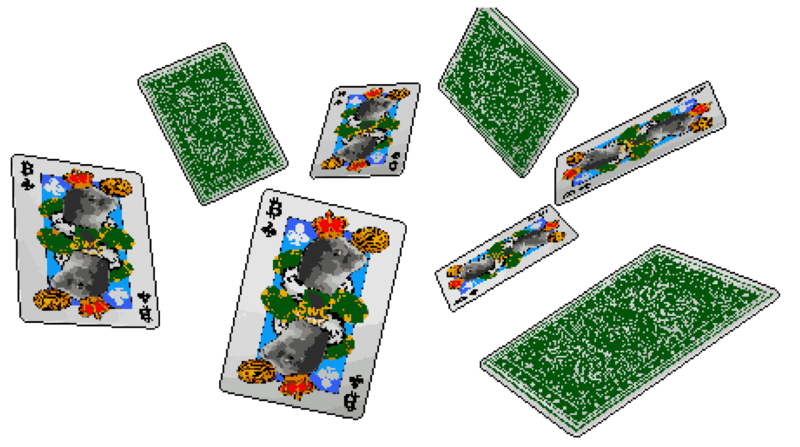 • Unlike 5-card poker hands, badugi hands consist of 4 cards at most. ‍• Aces play low, except in Badeucy. ‍• Straights and flushes do not apply to badugi hands. ‍• Only cards of distinct rank and suit may be played towards a badugi hand. • Two cards of the same rank or same suit count against the hand, and may not both be played. • The best possible hand is 4-3-2-A of four different suits. • A 4-card hand (also called a badugi) contains four cards of distinct rank and suit, and beats any hand that can only play three cards. • A 3-card hand contains only three cards of distinct rank and suit, but wins against any hand that cannot play at least three cards. The same rule extends to 2-card and 1-card hands. A player with 9-7-4-A of four different suits (a 9-Badugi) would win against a player holding J-3-2-A of four different suits (a Jack-Badugi). If both players have the same high card, the next highest card is compared. The hand 9-6-5 of three different suits (a 3-card 9-6) wins against 9-7-A of three different suits (a 3-card 9-7). Players with identically sized and ranked hands tie and split the pot.